Beach: Eastville Point Beach 1.6 mi. Welcome to our home, Shelbourne House. 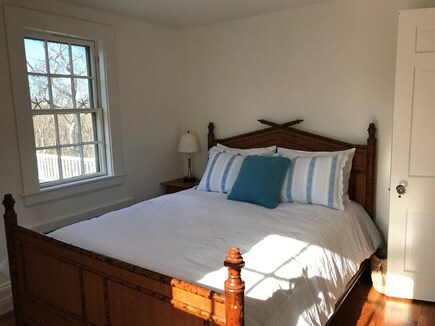 This wonderful house was originally built in 1924 and is located in a quiet neighborhood ten minutes' walk from Main Street Vineyard Haven, the Steamship Authority ferry, and Owen Park and Beach. 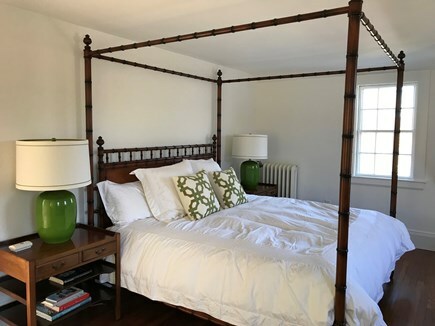 Our home has been lovingly renovated over the past year and a half with great attention to detail and to the original integrity of the house. It is situated on a beautiful lot in a quiet neighborhood with a side patio overlooking the garden. We are walking distance to the beautiful new Martha's Vineyard Museum. downtown Vineyard Haven as well as Lagoon Pond. The spacious, new, fully stocked kitchen has handcrafted walnut cabinetry and all new appliances. 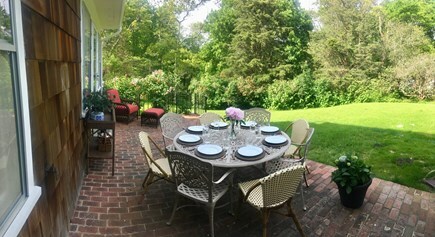 Adjacent to the kitchen is a beautiful sunny dining room with seating for eight. Step out to a private red brick patio with new grill and outdoor dining. The large spacious living room with fireplace is beautifully decorated and leads to two sun rooms with French doors. Originally called the ''Bridge Room,'' this is the perfect place to watch a movie or play a board game on a rainy day. The ''Library'' has an extensive collection of books on the Vineyard and the Islands. Also many wonderful book on coastal living, decorating and Ireland. There is a large master bedroom on the ground floor that looks out to the garden. The master bedroom has a TV and the master bath is fully renovated with marble floors and full glass shower. Upstairs has three additional bedrooms. 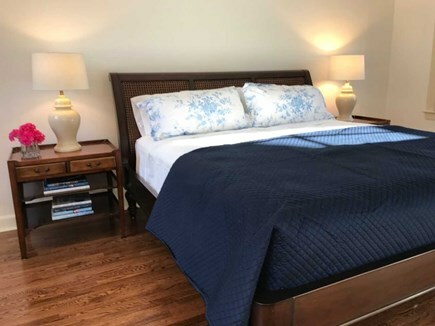 First bedroom is a large sunny room with a king bed. Second bedroom has a queen bed, and the third has twin beds. 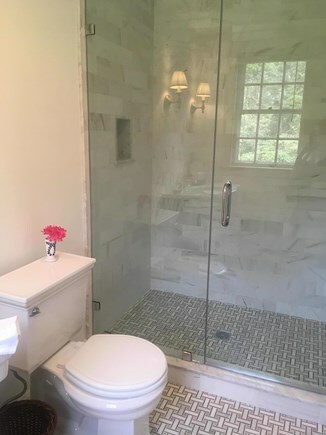 The upstairs bathroom has been completely renovated with full glass shower and marble floors. We provide quality linens and bath towels. Nearest beach: Eastville Point Beach 1.6 mi. A great and warm home that I’d recommend to anyone! 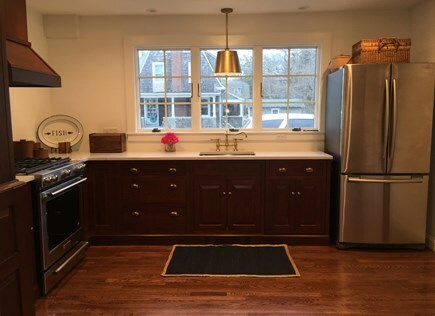 It’s a beautiful home carefully renovated and open, perfect for families and an easy walk to the shopping/restaurants in Vineyard Haven. We very much enjoyed our stay at this clean, charming, beautifully decorated home. Everything is brand new! There are plenty of linens, the kitchen is well stocked, and we loved the Irish embellishments throughout the place. The house is on a quiet street and is so close to town. The back patio and yard complete the perfect place for the perfect stay! We rented Shelbourne House this past weekend for my husband's 50th birthday. It was a ten minute walk to down town Vineyard Haven The house was immaculate and beautifully decorated. We were a party of seven and we found the house to be extremely spacious. The kitchen was fully stocked, Caroline thought of everything! The long weekend was too short and we will definitely be back this summer! My husband Chris and I have been coming to Martha's Vineyard for over 30 years and dreamed of someday buying a home here. I am originally from Dublin, Ireland and came to America in 1986. A year later, I visited the island for the first time. I fell in love with Martha's Vineyard, as so many of the island's vistas particularly around Chilmark and Aquinnah reminded me of my home country. We purchased the house in 2016 and have been painting, remodeling and decorating with our three daughters helping whenever they can. 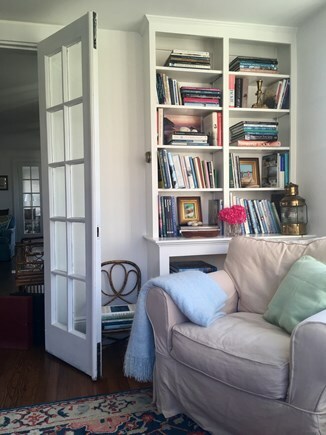 I inherited my love of interior decorating from my mother Deirdre who decorated our childhood home in Ireland with bold colors and amazing antiques that she sourced from estate sales and auctions. I look forward to sharing our labor of love with you and your family! Shelbourne House is unique home originally built in 1924. 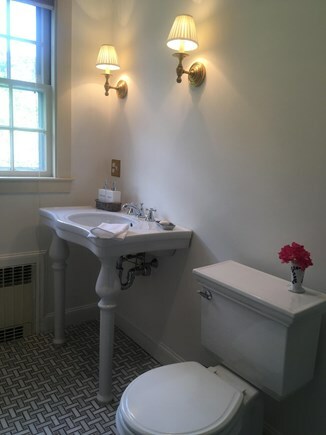 The house has retained all of the original charm and architectural features that make it so special. My favorite room in the house is the Library. I love to sit by the window and have a cup of Irish tea, browse through the wonderful books that we've collected over the years, and sometimes even take a nap! The house has an abundance of beautiful light during the day and when the windows in the Library and Bridge Room are open, the breeze through the house is refreshing! The rooms are full of light and character, making the house feels airy and spacious. Outside, off the dining room, a red brick patio overlooks the garden and creates a beautiful setting when dining al fresco at night. Vineyard Haven is a wonderful all-year-round town. In ten minutes, you can walk from the house to the center of town, strolling along Main Street towards Owen Park and Beach. We have spent many days here with our daughters sitting on the beach and crabbing off the dock. There are bathrooms and a shower to rinse off before heading back to the house. I love to sit and read the newspaper or watch the ferries come and go throughout the day. 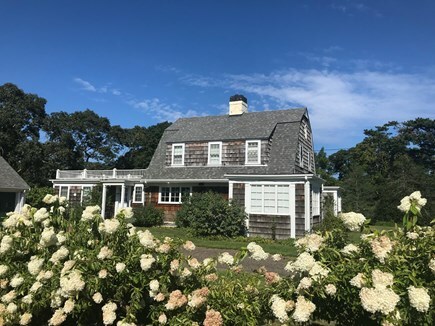 There are many cultural attractions downtown such as the Martha's Vineyard Playhouse, Martha's Vineyard Film Center, Capawock Movie Theatre, Vineyard Haven Public Library and the Martha's Vineyard Hebrew Center, not to mention many art galleries and artisans stores. We have many wonderful restaurants such as the Artcliff Diner, Beach Road Restaurant, Guard East, Black Dog Tavern, Mad Martha' s Ice Cream and La Soffitta. Mocha Mott's is a lively spot in the morning and they serve up a great cup of coffee. The Black Dog Bakery has amazing fresh baked muffins and breakfast sandwiches. We have some wonderful shops in Vineyard Haven, and I could spend hours in Rainy Day and The Beach House alone! Newly opened Refabulous Decor is a wonderful shop that also offers classes and workshops on furniture painting and jewelry making, a wonderful addition to the town. The Vineyard Haven Band performs every other Sunday evening at Owen Park and check the local calendar for Bon Fire on the Beach, a classic summertime event!